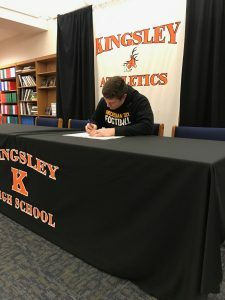 Kingsley High School senior Ian Sousa has signed his National Letter of Intent to play football at Michigan Technological University. 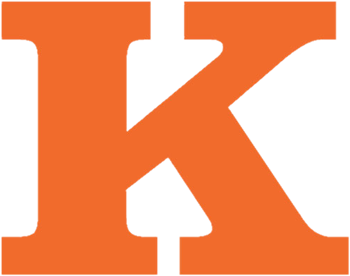 Ian has earned varsity letters in football, track, and hockey at Kingsley High School. Sousa was named 1st team all NMFC as a tight end in 2018 and was an honorable mention all-state TE as well. Ian was also extremely disruptive on the defensive side of the football and plans to play on the defensive line at MTU. 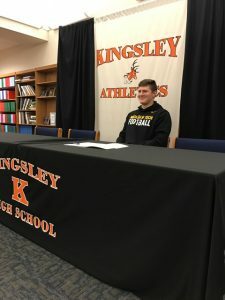 Sousa was a large part of the Kingsley football turnaround in 2018 – a team that finished 10-2 and played for a regional championship at Thirlby Field. Ian believes Michigan Tech is a perfect fit based on its size and academic offerings. He is excited to take the next step in his football career, and plans on majoring in Biomedical Engineering. 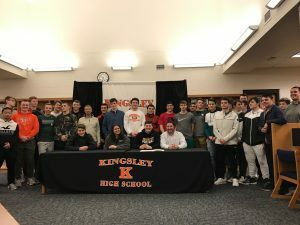 Sousa signed his National Letter of Intent in the Kingsley HS Library on Wednesday, February 6, 2019.